Even though the sun is luring you outside, don’t forget to visit the Tropical Conservatory and Marnie’s Pavilion, as well. The longer days and stronger sun affects these plants too, and they tend to bloom prolifically this time of year. 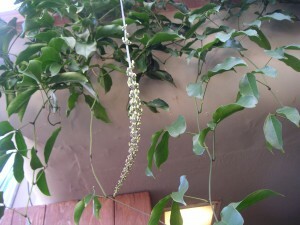 Several amazing vines in the Conservatory are flowering like crazy just now. 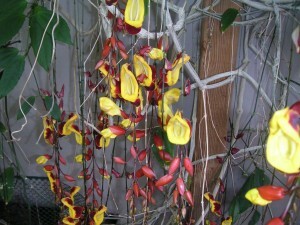 The Clock Vine (Thunbergia mysorensis) drips burgundy and yellow flowers from the pergola on the upper level. 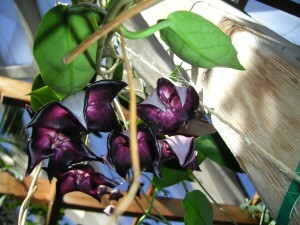 Just next to it, a Hoya (Hoya macgillivrayi) produces nearly black, bat-winged flowers from balloon-shaped buds. And, most exciting of all, our Jade Vine (Strongylodon macrobotrys) is preparing to bloom again, for only the second time in its 10-year life here at the Gardens! The Jade Vine blooms are not to be missed, with a color unlike any flower you have seen. 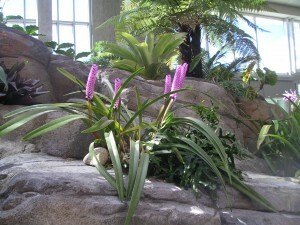 Look for the peduncles to start opening in a week or two, above the balcony in the Conservatory. We just have a couple now, but, with luck, more will follow! You call that an orchid? Yes, actually, we do! With leaves that look like an amaryllis, and tiny magenta flowers piled together in a cone shape, this is not an orchid most of us are familiar with. It is called Arpophyllum giganteum, and you can see it in bloom in Marnie’s Pavilion. Longer days make all the plants around here--not to mention the humans--very happy!